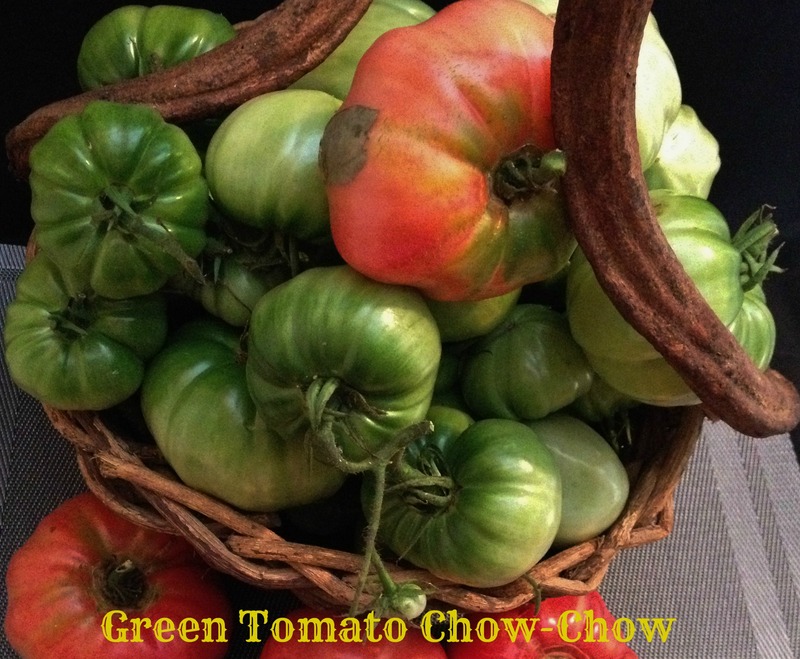 This is my Dad’s Green Tomato Chow-Chow recipe. I think it originates from Nova Scotia, Canada as it is also known as “Nana’s Chow-Chow. It is made only with green tomatoes and onions, vinegar and spices. 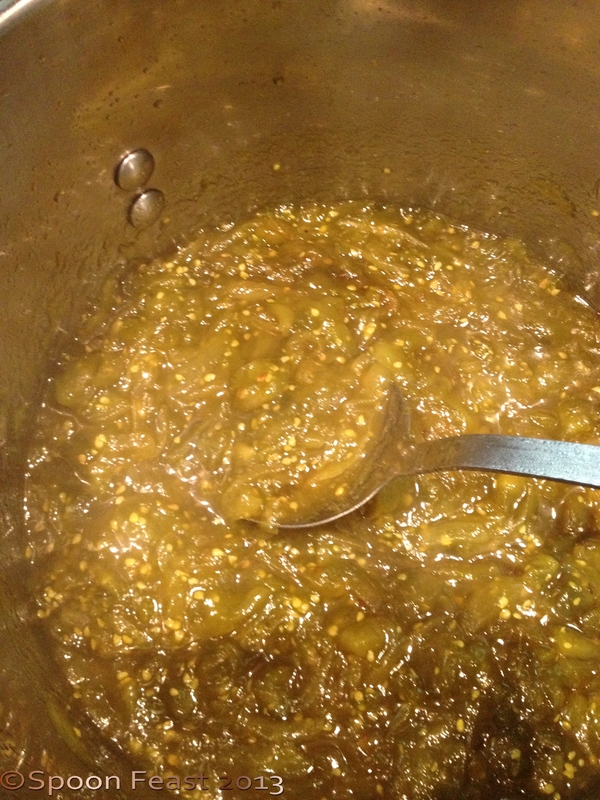 All my life, I’ve eaten precious rationed portions of this delicious mixture and called it Dad’s Green Tomato Chow-Chow. I’m here to tell you this is really good stuff. There are many recipes for chow-chow out there, Southern recipes call for everything left in the garden that is harvested just before the first frost: cabbage, peppers, onions, cucumbers. This one is different. And, it gets better as it ages. Wash the tomatoes, and there is no peeling or seeding required! Wash and slice the tomatoes and onions. in a large bowl, sprinkle the salt over the tomatoes and onions; set a plate on top, cover and let this sit overnight. In the morning, rinse the tomatoes and onions to remove the salt. 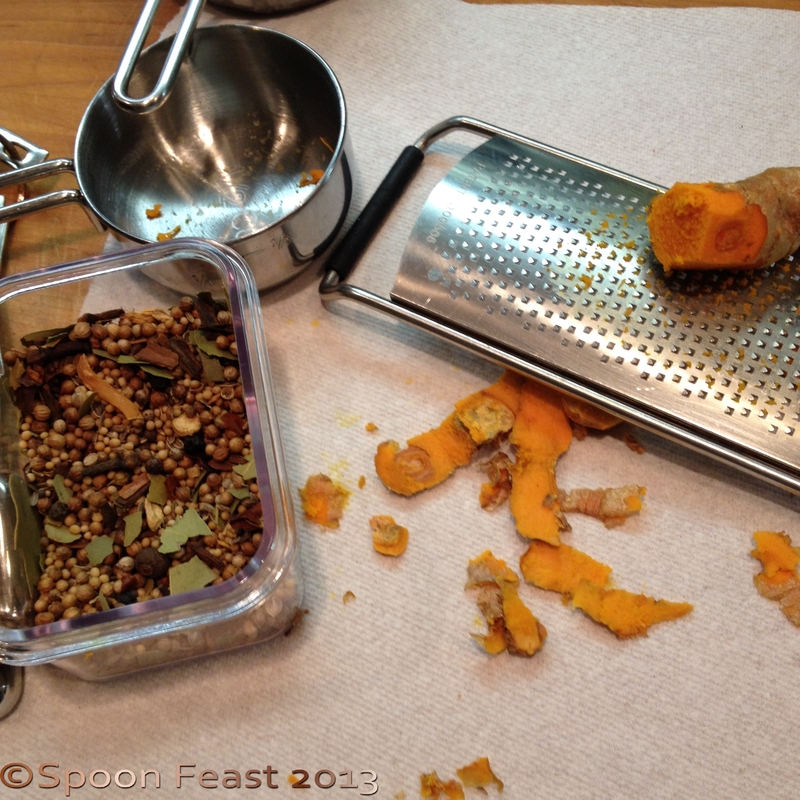 Strain, place into a large pot with the vinegar, sugar, turmeric and pickling spice. Bring to a boil, reduce to an active simmer and then let this simmer for 1 1/2 hours. Stir frequently to prevent sticking. The entire mixture will cook down to a lovely sweet, tangy concoction with a jam like consistency. This is so good on grilled meats, as a glaze for ham or chicken or as a condiment with cheese. One of our favorite ways to have it is with beans and cornbread. It makes the meal. 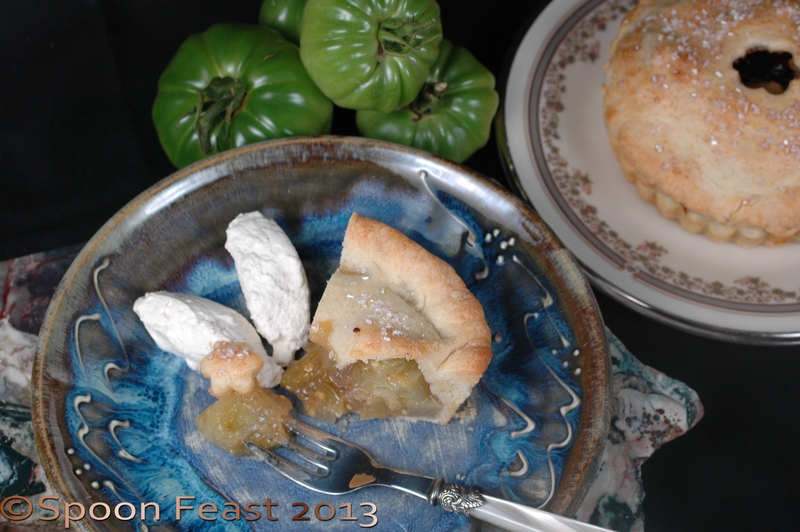 My Dad says this is a real treat because it is only made with the green tomatoes picked just before the first freeze. He says he can’t pick a tomato when it can turn red on the vine. He loves his tomatoes! I know he spoiled me from store-bought tomatoes. Every year, I always grow a plant or two. Sometimes successful, sometimes not. It’s a tradition to grow tomatoes every year. I’ve encouraged mom to make him a Green Tomato Pie because he has been fascinated with making pies that taste like apple but not using apples. In the past he’s used zucchini and Ritz crackers (separate pies), so I hope he can add green tomato soon. When I asked mom to make him a pie, he quickly said there weren’t enough greens left and frankly he’d rather have chow-chow. I’ll have to wrap and send him a bottle to see how he likes it. This entry was posted in Recipes and tagged Chow-Chow, Green Tomato, green tomato chow, green tomato chow-chow, Onion, Pickling, Tomato, Vinegar. Bookmark the permalink. I think chow chow must be what we call chutney. It looks and sounds similar. I believe it goes my many names. But by any name, it is still wonderful! Looks absolutely delicious,, we are pleased it turned out so well enjoy!!! I’ll send you guys some. Hopefully it will survive this time! Looks wonderful and what a great blog you have here! Thanks Chica, I like your blog too! I’m from Nova Scotia Canada. Glad I stumbled across this recipe. I shall e making this for sure. Just waiting for a few more tomatoes. Thanks for sharing!! Can you tell me your process for canning this recipe safely? There are many sites all over the web that will walk you a safe canning procedure. There are even classes if you look around. 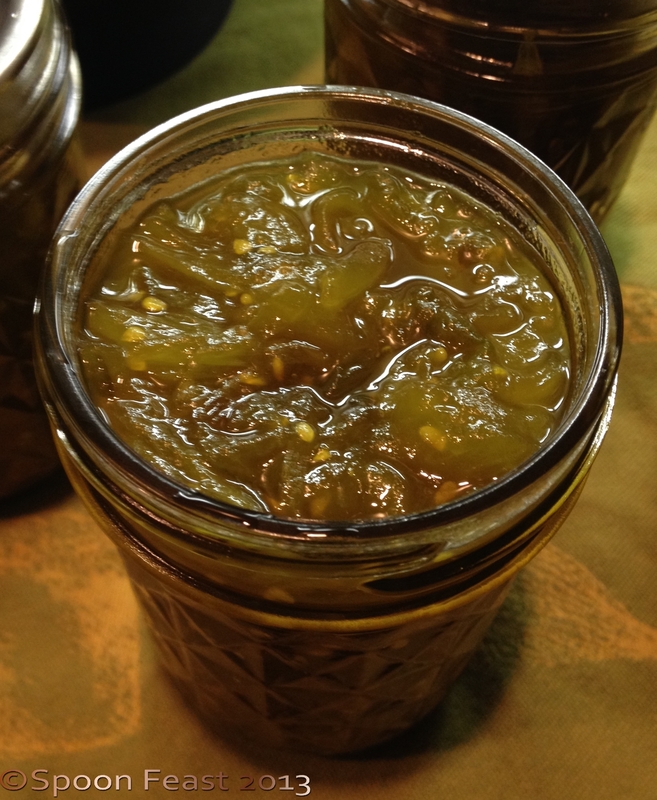 My husband is from PEI and we use to be sent home with jars of ‘chow’ and i was not so sure i liked it but I had some green tomatoes this fall, found your recipe and made a batch and LOVE, LOVE, LOVE it!. I brought it to a pot luck and now passing your recipe on.. I like the simple ingredients. My husbands family puts other veggies in it but this simpler one is much better. i did cut down on the sugar a bit and still great. Thanks for sharing and love your blog – it is beautiful too. How much does this recipe yield? This is the same recipe I always made but lost it along the way. I can taste it now. Thanks for posting. This will make a couple of quarts. I pack it into smaller jars so we don’t use it all at once. Mmmm…I love chow – chow. I’m from Nova Scotia and now live far from there. But there are some dishes that cry out for chow to accompany them: any fried fish – especially mackerel and trout – and my favourite, salt cod fishcakes. It must be that time of year! I’m craving more chow chow and dreaming up ways to use it up. Mixing it into mayo for a flavored mayo is the latest…AMAZING on a sandwich! Hi Bob! My Dad wouldn’t let us pick the tomatoes when they had the opportunity to ripen. He loved his vine ripened tomatoes! Before it froze, it was a rescue mission for all remaining greens on the vine. I really look forward to October so I can simmer this glorious concoction. Enjoy those fish cakes! 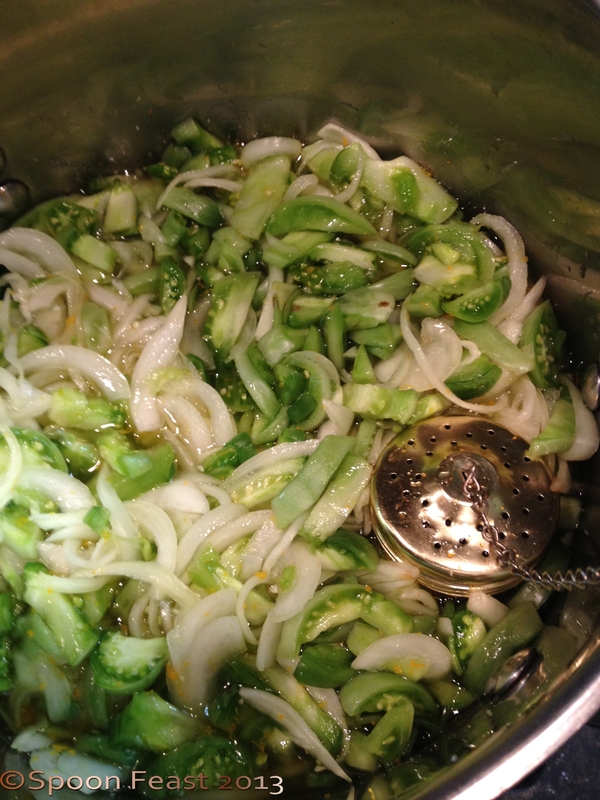 On this green tomato and onion relish can you store it on a shelf or do you have to refrigerate it? Looks very good can’t wait to try it. What kind of pot can I use to cook it down in? If you want to store it in your pantry, you will need to can it. I store mine in the fridge and unfortunately, it is gone before I know it. Use a stainless steel pot to cook it down, stainless is the best to cook with. My mom would say cast iron, which you can use too as long as it is well seasoned. This is my favorite condiment! I hope you enjoy making it and eating it as much as our family does. I have made chow in the past but upon Googling videos some folks actually boil the filled jars afterwards for 15-20 minutes. I have not done this before – not sure why they would if the jar and lids are sanitized and the mixture is hot. Do you recommend boiling afterward? Also, what about for beets and mustard pickles – boil jars afterward? If you want to store the filled jars in your pantry you will need to boil the filled jars in a canning process to keep it safe in long term storage. If you don’t keep them in the fridge so they don’t spoil on you. Mustard Pickles, pickled beets and pickled cauliflower are the same. This is the same way I make my chow. I am from Prince Edward Island and it is usually served with fish over here on the Island. My grandma, aunts and uncles used to sit around the table and talk about PEI and Newfoundland when we visited them in Glace Bay. Lots of great food was made, lobsters by the carload, making chow chow and Mustard Pickles. We love these flavors! Thank you Pamela for sharing, I have been looking for this recipe as our Mom could not find hers as we recently moved her and many on her old time favorites seems to have gone missing and it was one of our all time favorite. Here in New Brunswick we have a lot of green tomatoes that are refusing to ripen before the winter, so we are scrambling on what to do and this is exactly what I was looking for. Thanks again…it sure brings back found memories of when I was young. Hi Odette, I know what you mean! One taste really brings back so many family memories! 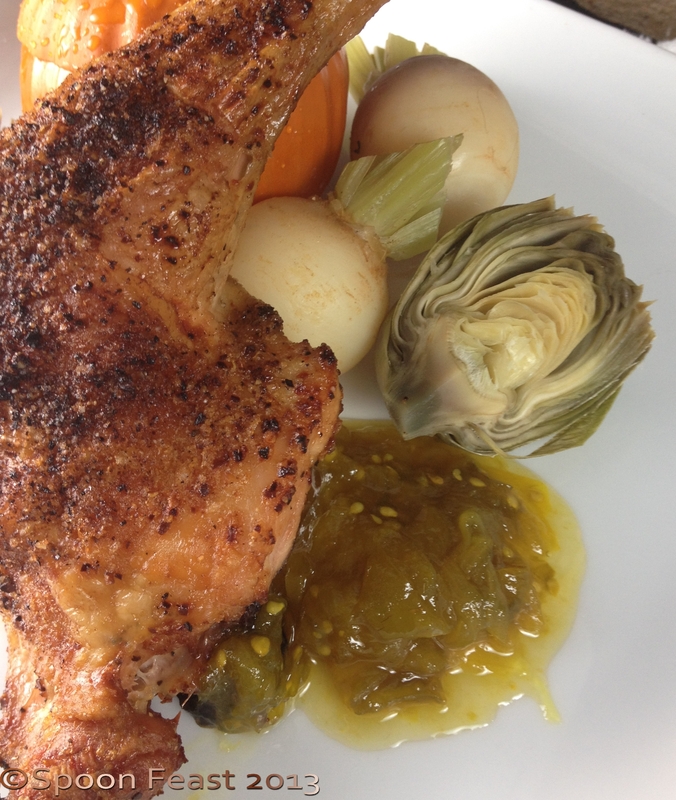 I’m working on a Mustard Pickle recipe next. It also is an old favorite from my moms childhood. Hey I loved this! I’m from Quebec and grew-up with both the red and the green version but always store bought made by Habitant and so delicious. I hope i have enough green tomatoes, thanks so much for the recipe. You’ll be so glad you made a triple batch this winter! Baked beans would be nice but down South, we boil pinto beans with spices until tender and the liquid thickens from the bean starches. Cooked in a crockpot for a long time, these beans, spooned over cornbread will warm the cockles of your heart. I like to make blue cornbread with yellow and white kernels in it; it’s so colorful! 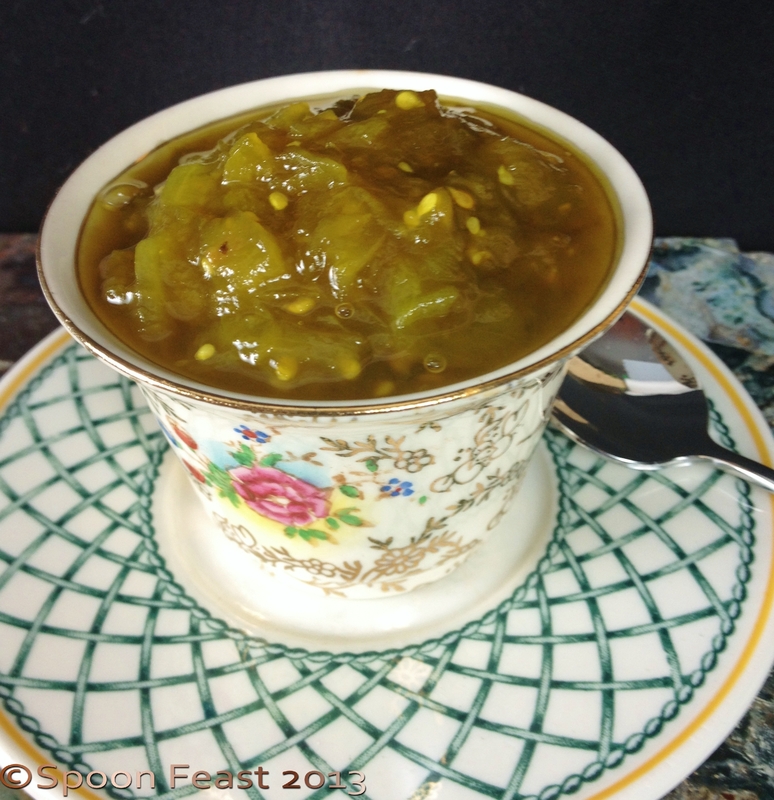 And you got to have a dollop of green tomato chow-chow along with it. Just found your chow chow recipe last night so made a quick trip to the store for spices and out to the garden for several pounds of hard little green tomatoes. This morning I started my first ever batch of chow chow! Being a night person I will finish and cook this evening. Hoping it is good enough to share with family. Thank you for the easy to follow recipe! I hope you love it as much as we do! Enjoy. My triple batch of chow chow is done! I was going to change out the vinegar and add jalapeños but I ended up following the recipe. I figured, if it’s that good, why mess with perfect right? Because if the large amount, I made 3 separate satches of spices to make sure they spread their goodness. I was worried because of the large amount and it needing extra time to cook. I ended up cooking it 15 minutes more and that was only because my jars weren’t completely ready. I got 11.5 pints out of it. I canned it the way I canned my zucchini relish. I simply boiled my jars and heated up my lids, filled them while trying not to burn myself, and let them seal on my counter as they cooled. I know it’s frowned on but it works! My zucchini relish has remained sealed for 2+ years and so I figured it would be fine with this. I tasted my .5 jar in the fridge and it’s really yummy. Milder then chutney. (Someone compared the two and they are completely different in my opinion.) It thickened up nicely and it isn’t runny at all. I can see a lot of uses for this. 🙂 Thanks for sharing the recipe! You ate right to do the here batches with spices because the spices don’t always scale up like you think they would. You have a lot of yumminess in your pantry now! Having been born DOWN HOME in New Brunswick,growing up eating and making pickles galore! for 2 1/2 yrs.I took it upon myself to make 214 Jars of pickles of all kinds.Once you have eaten proper homemade pickles,you will not buy them in any store again! Not really but it will last until next canning season in your refrigerator. I find, no matter how much we make, it’s always gone by summer. Can it in a water bath for 15 minutes to make it shelf stable or simply keep your jars in the fridge. Hi, I am new to green tomatoes and stumbled on your site via google. I was originally looking for a canning recipe, but I have a glass cook top and just found out that they can’t be used for canning. So, I was thinking of freezing it, but I’m a bit confused by your comment, “it will last until next canning season in the refrigerator”. How long can I keep it in the refrigerator? It will last a year in the fridge! One trick I learned is to fill the jars with the hot chow-chow, put the lid on and turn it upside down until it is cool. When you turn it upside right, the lid will be secure and should last as long as it’s kept cold. Open the jars one at a time as you use them through the year. I think it gets better with age! It smells wonderful and the spoonful I sampled is delicious. Thanks so much for the recipe! Finally, the real chow chow recipe! Yes, it is a Nova Scotian favorite and nothing compares to homemade chow with fishcakes, fried fish and especially with Rappie Pie!!! Thank you so much for sharing especially with the exact measurements. When I asked anyone in my family for the recipe, they will tell me to get a pail of tomatoes and a couple of onions and some pickling spies…….I can’t wait to try your father’s chow. Enjoy! It certainly is a dear recipe. My father passed away in April so I like to think this is for him! I make it every year and treasure every bite. Please let me know! It is a treasured recipe in our family. I hope it becomes one of yours too. I’m so glad I found your recipe a couple of years ago. My family is from PEI and I have lots of memories of this on the table. I made 3 batches then and everyone loved it! Made a single batch today and going to do more on the weekend. My upstairs neighbour sent a text asking what I was making that smelled so great. I guess I should give her a jar? Thanks for sharing!